There are just a few companies that have so many tuned models in their portfolio as for example BMW. Many and many tuning comapnies have produced enhanced models of this car manufacturer. That’s because the BMW’s cars has great design, quality build and of course high performance again that lure many companies doing improvements. And it’s quite interesting when some of these tuning companies have achieved some success, like a world record. And now we can talk about Brabus Rocket or G-Power Hurricane. And the last one is a car that is the today’s fastest car in the world. It’s based on a famous M5. Many people have faster heartbeat when they see the BMW car with „M“ letter. This „M“ is exclusively for sporting versions as the M5. 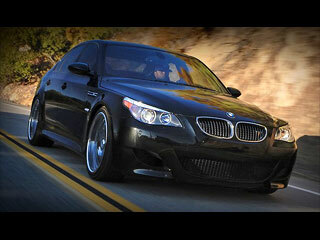 The BMW M5 is a sporting saloon including everything what a driver needs. That involves a comfortable and luxurious interior, high level of safety, amazing design and especially world-established powerful engine. This is the work of Bavarian engineers that have created one of the most interesting saloons in this class. There‘s no doubt that the BMW M5 is a sporting luxury. 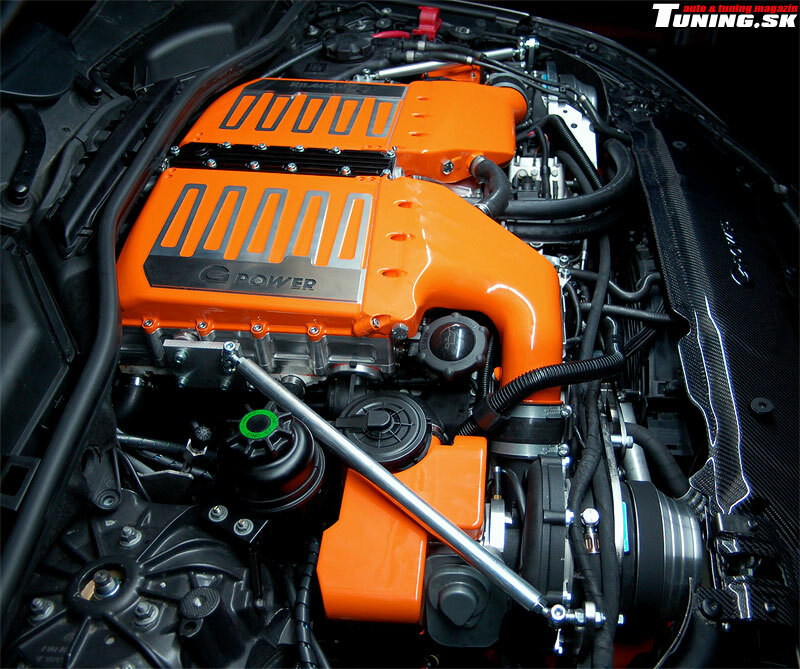 Its 5.0 V10 engine is one proof. This 4993cu.cm 10-cylinder is the international engine of the year for second time since 2006. And that means very much for the BMW’s engineers and customers. It’s the number one as the most powerful engine of 2006.The top output of this super engine is 507hp (373kW) at extreme 7750rpm. Also 520Nm of torque are very valuable at 6100rpm. This all catapult the car to 100kmph in 4.7 seconds. Even the name of this German company signifies that improvements are more about engines than design. This is also the case of the BMW M5 that’s now much more powerful and has decent visual modifications. G-Powers calls this project as „Hurricane“. The first step of the modification was the car’s exterior that is decent, but stylish. All parts of the bodykit are made of carbon fiber that is much lighter than ordinary parts. The front part has now a new bumper with three elongated cut-outs divided by two bars. There’s also a diffuser with a pair of side spoilers. 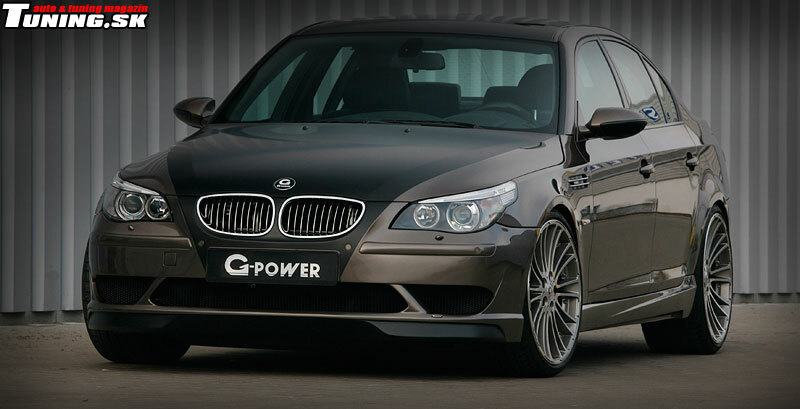 G-Power didn’t want to build a fancy, glossy show car, but a sporting and elegant vehicle. Sides of the car own very elegant, sporting side sills. They pleasantly copy lines of the front bumper and then continue. The modified bumper is also at the back and includes a diffuser improving air low under the car. Two pairs of exhaust tips are on its sides and hide somewhat very dangerous inside. The exterior tuning was completed with interesting paintworks where the roof, hood and trunk are darker. We didn’t lie when we mentioned about more important engine tuning. This tuner enjoyed its work on the engine and added a lot of horses. Especially thanks to a pair of special compressors T1-12 by ASA that handle around 1200kg each of air under pressure of 0.5 bar. So now we can see amazing 730hp (537kW) in action from 7500 to 8200rpm and 700Nm of torque at 7200rpm. These values are astonishing. Two tons of the car can beat 100kmph in less than 4.2 seconds and it can reach more than 340kmph without a limiter. 730hp and high speeds require also advanced suspension parts. So now the M5 owns the newest, adjustable sporting suspension with 9 available options. G-power took care about the braking system that has 400x36mm vented brake discs and biting strong 6-piston calipers. The beast stands on 21“ 10-spoke POWER SILVERSTONE DIAMOND rims wearing Dunlop slick tires (255/30 in front and 295/25 at the back). Some changes were made also in the interior that is full of popular carbon. The tuner is really proud of three-spoke Nardo Edition steering-wheel with luxurious Kjerba-Nappa leather upholstery. And something interesting in the end..
On January 31st 2008; G-Power Hurricane beat 360kmph in Papenburg and became the fastest BMW on the planet. Congratulations and good luck! 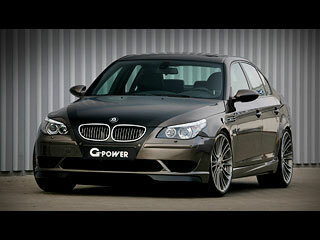 What is your opinion about the "BMW M5 G-Power Hurricane" ?